This trail is named after Nora Kuttner a pioneer of the trail system when it was just for horses. The Bud Turner Trail is another trail named after a horseman from the 1950s. The Nora Kuttner Trail extends from Euclid to Parks Road; .7 of a mile. Robert Ward Preserve is adjacent to the Nora Kuttner for its full length. He was a councilman for many years and worked very hard to negotiate the transfer of Chevron land to parks. By the way this preserve wasn’t a gift; it was only discounted some from the market value. It involved the transfer of properties and was very complicated. The red balloon marks a wide spot in the trail which is something of a reference point. Click on the map for a higher resolution version. Note the three artery trails that lead to the main trail. Notice also the extent of the Robert Ward Preserve. 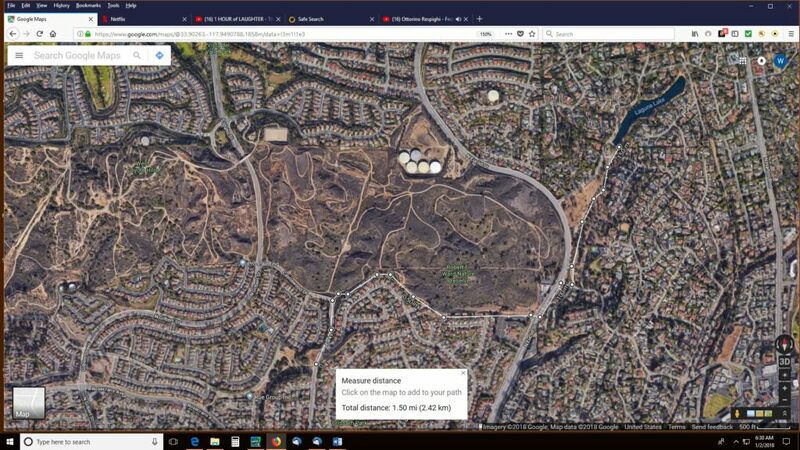 The large picture above is identified as the red balloon on the map to the right. It is good reference point for appreciating the Nora Kuttner Trail. This reference is roughly halfway between the ends. It is accessible from Camino del Sol. Camino del Sol is kind of a main street even though there not one inch of straight. It roughly goes along the Nora Kuttner although never closer than 160 feet. There are three places to park on Camino del Sol to get at the trail. (Those places have tributary trails to the main Nora Kuttner Trail which shows excellent planning on the part of the developer and the city.) The red balloon reference is a wide place on the trail because it is something of a junction. To the west is a dirt trail of 400 feet to Camino del Sol. (Parking along the street there is a good way to start in the middle of the trail.) That tributary from Camino del Sol is the first trail to/from the reference. East from the reference, downhill toward Euclid, Nora Kuttner is actually two trails; trails two and three. As can be seen in the large picture above, there’s a sign directing hikers and horses away from the trail for bikers. And is really good advice because it is the fastest downhill run in all of Fullerton. There’s a fourth trail at this junction which is actually the continuing of Nora Kuttner north-east. It continues uphill for a while then curves at first westerly and then continues to curve to the left, to the south-west. The Nora Kuttner Trail ends at a street which is a thousand feet from another reference point; Tree Park. Tree Park may be the most important reference point for Fullerton Trails. It can serve as a meeting place for a group to begin walks on four different trails. Click here to go to the Rosecrans Trail, Tree Park for more on its use for groups. Nicolis entry, looking up the trail. Walking is on the right, bikes on the left. Nora Kuttner Trail is a little unusual for walkers in that there are so many starting points where the red balloon mentioned above is just one of them. On the map you can see three places along Camino Del Sol to park next to the trail. There’s also the end at Tree Park. Perhaps the most convenient place to park is Nicolas Drive. From Rosecrans (west of Euclid) take the first street right and then look for Nicolas Drive. Walking east toward Euclid is straight downhill. Crossing Euclid is a little scarier for walkers than it is for bikers. Bikers are used to being with traffic and usually cross in the form of very long S that puts them with the traffic until it is safe to cross the opposing traffic. Walking seems scary because Euclid is so wide. (It takes about half a minute to get across if you are walking.) Instead stay on the west side of Euclid and then cross at Laguna Road. Here’s a note about signals that may clear up a mystery as to why they make wait. Now or later, what’s the difference to the traffic, right? It’s as if they don’t want you to ever have instant service for fear of abusing the service. (Yea like if we knew it was instant we would be crossing the street, back and forth, all day.) There is an engineering reason. They have to fit your going across with the timed traffic flow. Yes the entire length of Euclid is synchronized. 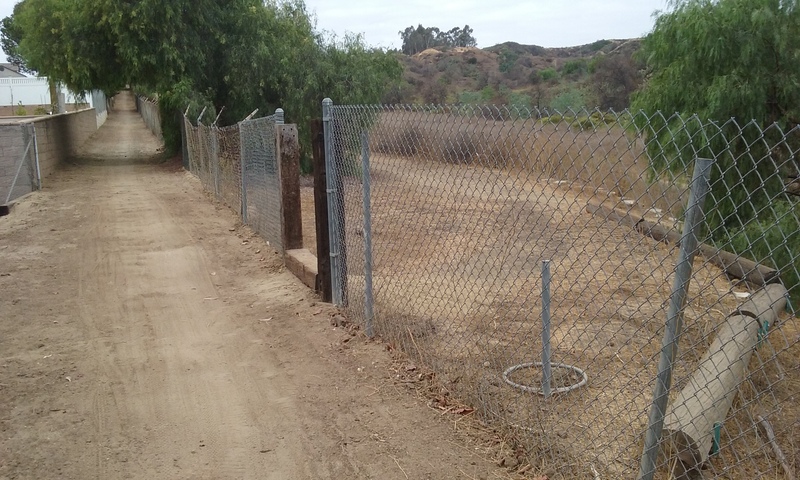 The trail through Laguna Lake Park begins about fifty feet beyond the Laguna Road crosswalk. 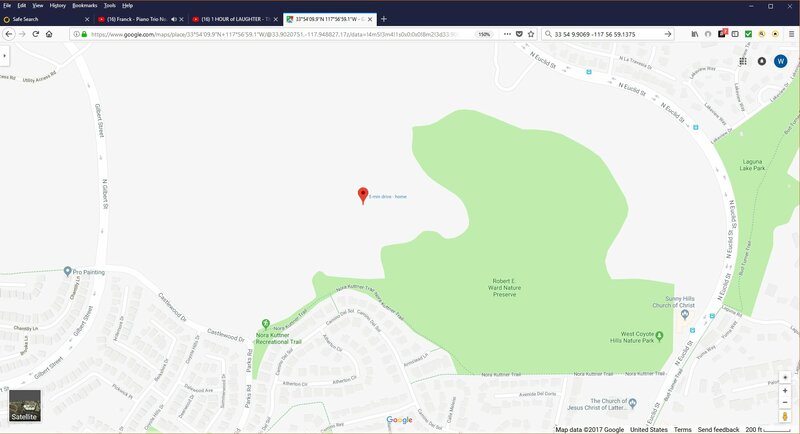 It should be noted that the official part of Laguna Lake Park is the long stretch of groomed dirt and trees that is actually longer than the lake. If you walk around the lake before heading back, it doubles the length of the walk. (The lake perimeter is about ¾ mile.) There is a bit of history about this park written in the Laguna Lake webpage. The trashcan at the top of the world. In the background is a prominence which has a flat area on top for a picnic and a pretty good view looking east. How to get up there is detailed in the text below. You can see your destination from the trashcan area. Approach One is around to the right which gets narrower and narrower and then climbs to the destination to the left using the fence to help balance you. That’s one way. 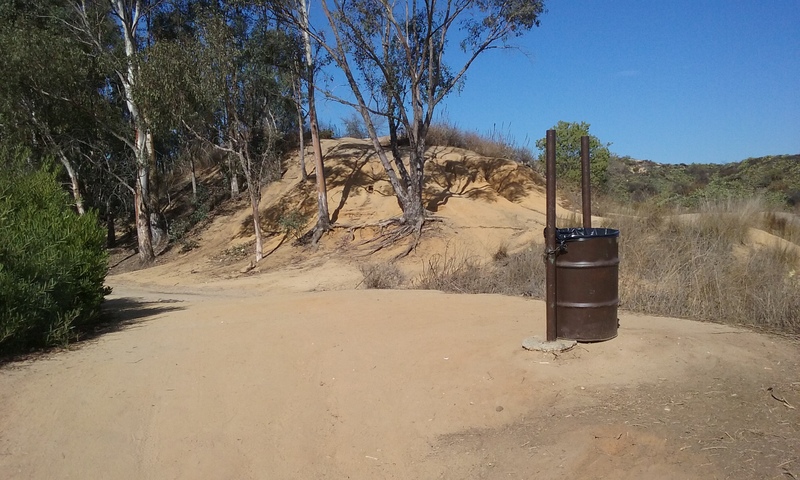 If from the trashcan, you took the main trail to the left there is Approach Two. It looks worse than it is. Perhaps someday this way will be massaged with some volunteer effort which would inspire the Parks Department to put a park bench on top there if for no other reason than to remind people to appreciate the view. There is however, another view spot that is to die for. 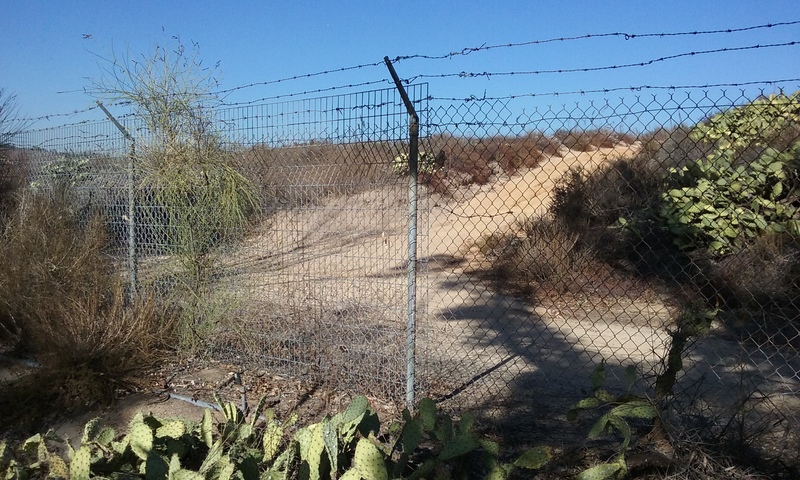 Unfortunately the wonderful opening in the fence to that place is often blocked by the owners of that property; Chevron. They are afraid we might steel some of their oil. For those scofflaws among you, use Approach One described above, but continue along the fence for another hundred feet or so. Hopefully you will come across an opening that hasn’t been covered yet. Note how well-worn the path through the fence is. You can tell it is a very common place to visit because the path through that opening is worn exactly as much as the rest of Nora Kuttner. Other openings which have been covered by Chevron show just as much wear. 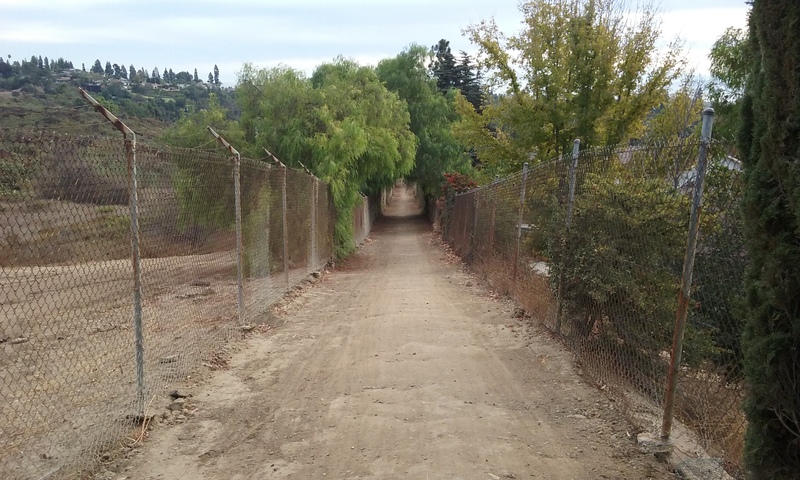 If you dare be a trespasser (and join thousands before you) pass through the fence if there’s an opening, go a few hundred feet further along an extremely well worn trail to –without a doubt– the best view from anywhere in Fullerton. Perhaps the county. There are other places just as high, the top of Panorama Trail for example, but this is the only one with a 360 degree field of view. The Panorama Trail high places have trees that have been water for 30 years that entirely block the view in one direction or another. 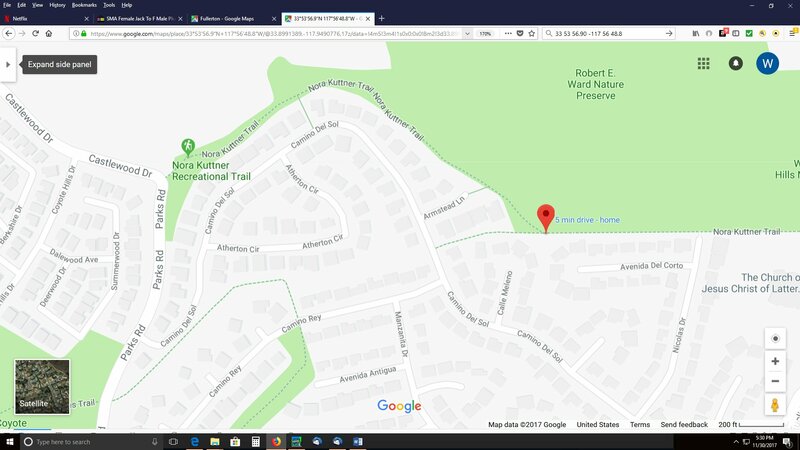 There are other places (Hawks Pointe Trail, and Tree Park) where trees grew up 20 years after the park benches were bolted to a slab of concrete. The only view south on Castlewood has recently been planted. West side of Parks Road, next to Tree Park is the easiest to get to parking but an alternate place to park for the 1.08 mile loop is under the text in white that says “Camino Del Sol”. Your car is then right next to the start of the loop. The Nora Kuttner Trail is part of an 11 mile bicycle loop. But a one mile loop can be made with most of the Nora Kuttner Trail and less than half the length on sidewalks. A good place to start is Tree Park. 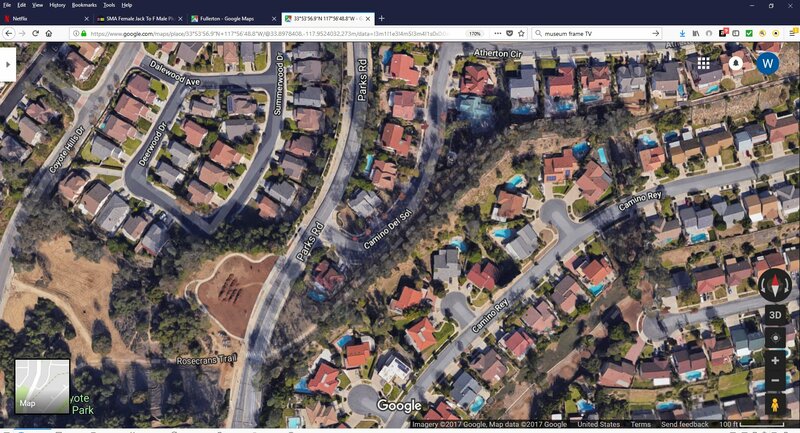 The map titled Nora Kuttner Loop in the gallery below shows that it is about 1/3 mile north of Rosecrans. Note that it is only on the park side of the road that you can park. This 1.08 mile loop begins across the street at the crosswalk. It goes behind a house and then uphill (going north). This portion of the trail is officially Parks Road Trail but unmarked on Google Maps. It will curve around almost 180 degrees to Camino Rey. Continue your walk along Camino Rey sidewalk to the left. (You will see a trail across the street that goes down to a very long park. That’s another journey.) The 1.08 mile loop described here, has you walk on the sidewalk east for about 700 feet. 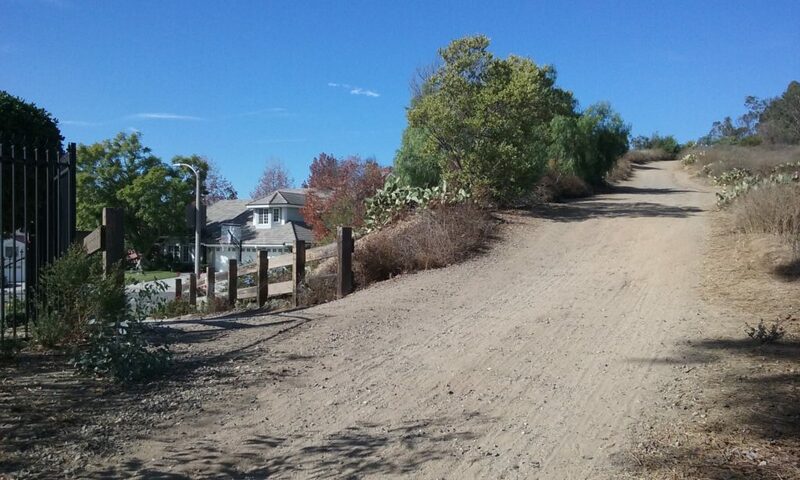 At Camino del Sol go uphill about 150 feet. You will see an entrance to a trail on the right. That will take you to the reference point (red balloon) of the Nora Kuttner. But to go back to where you are parked, you have to make a very sharp left turn and go uphill. You will pass the “well placed trash can” and the prominence that offers the fabulous view mentioned above. The rest of the way is all downhill. You will emerge at corner of Parks Road . This point has a large sign that marks the official end or beginning of the Nora Kuttner trail. You should be able to see your car from there; about a block south. 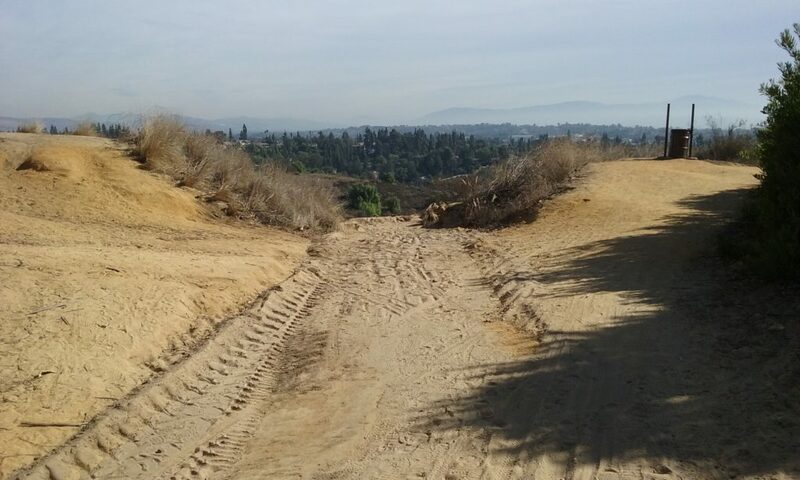 Looking down to Euclid on fastest bike trail in Fullerton. . . . If you are walking, you want to be to the left of this. The loop described above has you start near Tree Park and then come back there. You can also use that starting point to go all the way to Laguna Lake which was the goal for the first out and back described above. Starting at Tree Park is good if you want to walk with friends in that it is a good gathering place. (Park benches.) You can park along side Tree Park. There seems to always be room there. 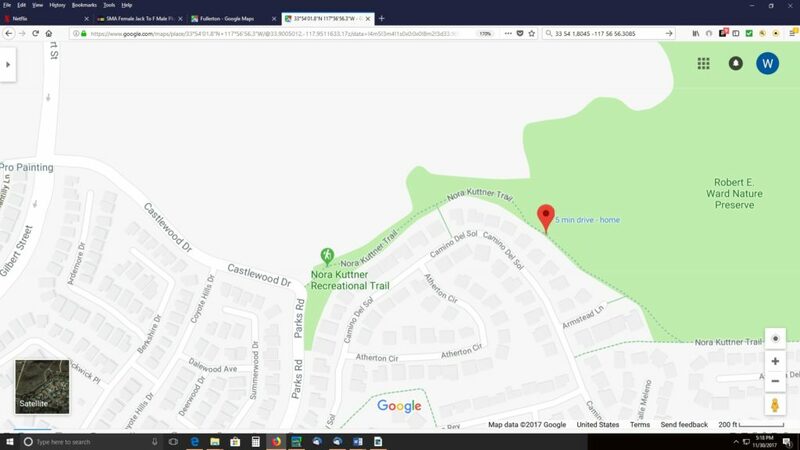 Walk along Parks Blvd to the official grand West Entrance to Nora Kuttner Trail. It should be noted that every yard of this trail is next to the Robert Ward Preserve. Note in the map how narrow it is though, for most of that length. Walk uphill, past the place with the fabulous view, past the place where the well-placed trashcan is, and down the straight run (not on the bike race way) to the Euclid grand entrance. Go north on the west side of Euclid’s sidewalk to Laguna Road. Cross there at the light and an additional 50 feet to the official entrance of Laguna Lake Park. It’s another .4 miles to the lake. If you go around the lake before returning, add .75 miles to the 3 miles. Tree park to Laguna Lake. The full length of Nora Kuttner and then some. Yes, we have a place where you can fall and break a leg. And no, the neighbors can’t hear you. So don’t go alone if you like to look over the edges of cliffs. This is the place of that reference balloon… the halfway junction, looking west. The left trail is a feeder trail from Camino Del Rey. one of three such arteries. This shows how far Robert Ward Preserve has to extend to capture the best 360 degree view in the county. There is a place where people are constantly opening the fence and the oil company is constantly fixing it. 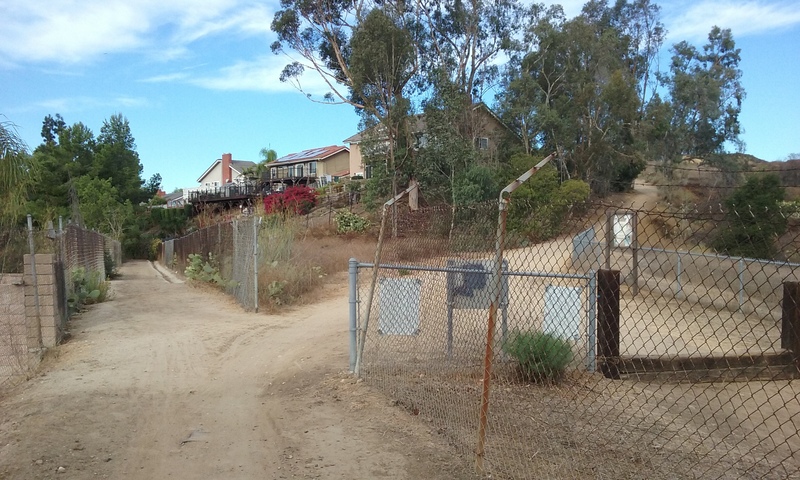 The trail on the Chevron side is just as warn as the rest of Nora Kuttner. It is as if this is the only place people go. And there’s good reason. It is a view spot that is unimpeded by trees. No other spot in Fullerton offers that experience. The west down hill side of the trail shows the beginning of ruts formed by the U-channel getting clogged up. 33 54 2.9855 -117 57 2.1313. Note: Fullerton is about 22 sq miles 14,000 acres. Coyote Hills has a 6 mi perimeter, but is only 1 sq mile in area 640 acres; only 4%. The Robert E. Ward Nature Preserve has a 1.8 mi perimeter and is a tenth of a square mile in area (73 acres). Perhaps a volunteer project would be to pioneer a perimeter walk.